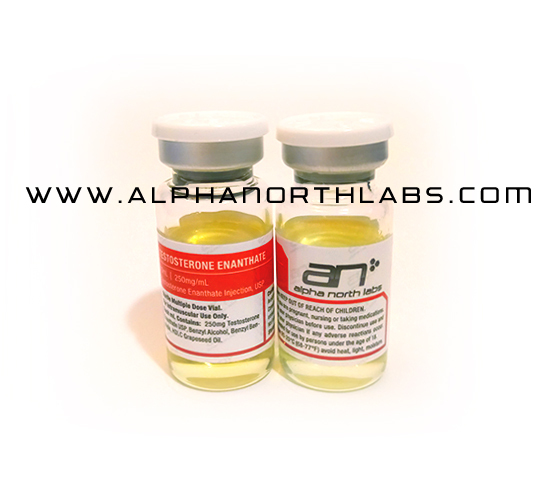 Testosterone Enanthate (test enanthate) 10ml – 250mg/ml is a long ester testosterone that is likely the most popular testosterone ester. It’s popularity is due to the fact that it can be used once a week allowing for less frequent shots. This is the exact hormone that your body produces and so it is the drug of choice for testosterone replacement therapy. Testosterone is the hormone most responsible for mucular growth and recovery, and so adding extra testosterone will greatly enhance size and strength. Testosterone is both highly anabolic and androgenic. This mean it effect your growth as well as your sexual libido. The downside of testosterone is that by adding extra testosterone your body will try to regulate it and eliminate the excess testosterone in a number of different manners. It will down regulate it by converting some to estrogen, and will stop natural production as well. This may lead to estrogen related side effect as well as a suppression of your hormonal axis which will leave one in a testosterone deficient state once testosterone replacement is discontinued. Estrogen related side effect include bloating, gynecomastia, high blood pressure, etc. We do not suggest the use of testosterone for women. It is highly androgenic and will easily cause virilization. There are a miriad of altered testoterone derivative that will help with muscular growth that are not as likely to cause the irreversible side effect of virilization; deepening of the voice, body hair growth, clitoral enlargement. Not something most women desire.